A constellation is an area of the celestial sphere as defined by the International Astronomical Union (IAU) in the early 20th century. Constellations are typically grouped around asterisms, patterns formed by prominent, relatively bright stars that appear to be close to each other in the night sky. These star patterns themselves are often mistakenly called constellations, whether they are famous asterisms like Orion’s Belt, the Big Dipper or the Southern Cross, or less familiar patterns formed by stars visible to the naked eye and belonging to one of the 88 constellations. While the modern constellations are seen as areas of the sky used for orientation and arranged in a grid-like map of the celestial sphere, the term is still colloquially used to refer to the visible star patterns and prominent asterisms, which are only smaller elements found in constellations. The constellations themselves are much larger than asterisms and occupy considerably larger areas than the prominent star patterns. 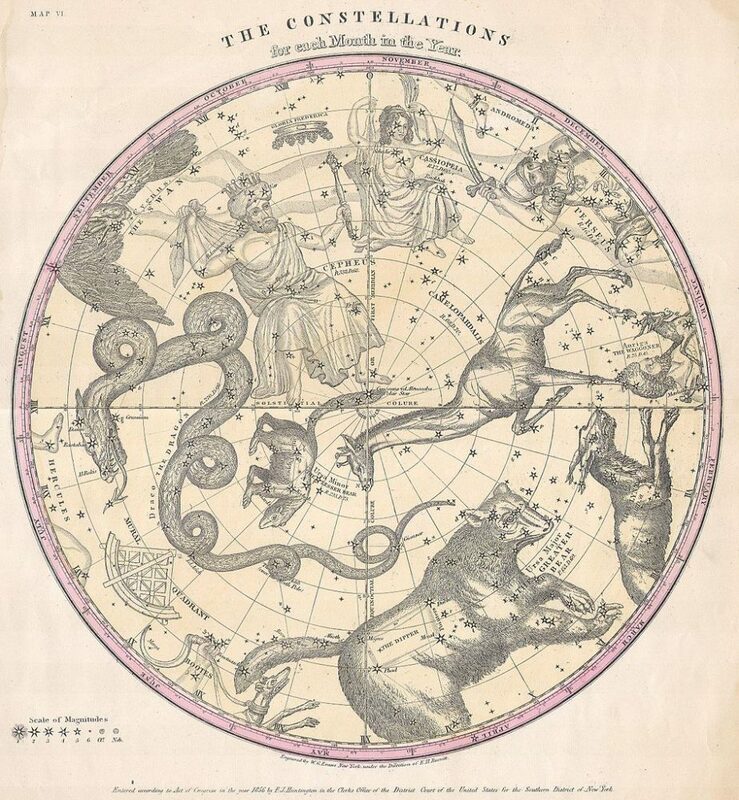 The Constellations for Each Month in the Year, 1856 – This rare hand colored map of the stars of the northern hemisphere was engraved W. G. Evans of New York for Burritt’s 1856 edition of the Atlas to Illustrate the Geography of the Heavens. It represents the night sky and constellations of the northern hemisphere. 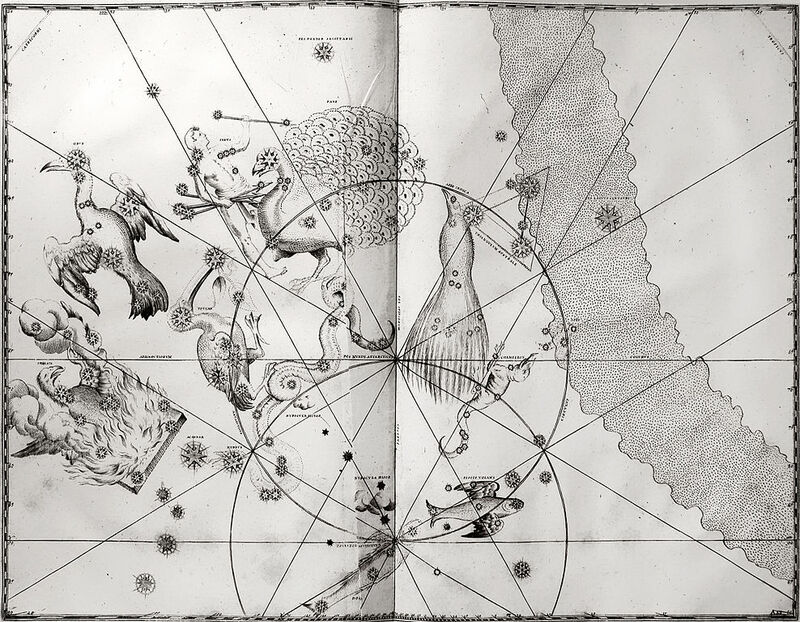 Constellations are drawn in detail and include depictions of the zodiacal figures the stars are said to represent. 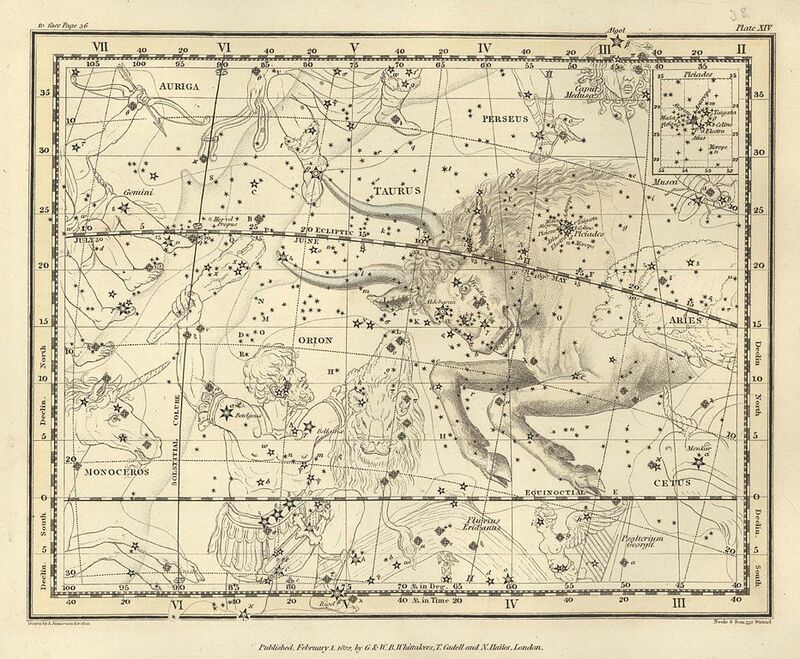 Included on this chart are Ursa Major (Great Bear or Big Dipper), Ursa Minor (the Little Bear or Little Dipper), Draco (the Dragon), Cassiopeia (the W), Perseus, Camelopardalis, and Cepheus. Chart is quartered by lines indicating the Solstitial and Equinoctial Colures. This map, like all of Burritt’s charts, is based on the celestial cartographic work of Pardies and Doppelmayr. The borders of the modern 88 constellations were defined by the IAU in the early 20th century. 48 of the modern constellations, mainly those visible in the northern hemisphere, are based on the Greek constellations, documented by the astronomer Claudius Ptolemy in the 2nd century. The celestial sphere was divided into 88 official constellations in 1922 by the IAU with the help of American astronomer Henry Norris Russell. In 1930, Belgian astronomer Eugène Delporte devised the boundaries between the modern constellations along horizontal and vertical lines. Delporte based his work on that of Benjamin A. Gould. Most of the modern 88 constellations kept the names of their predecessors, which were the 50 ancient constellations, dating back to Greece, Rome and the Middle East, and the 38 constellations that were created more recently. However, there were many other constellations over the millennia, and they weren’t the same from one culture to the next. Some of these historical constellations – including Quadrans Muralis, created in 1795 and later divided between Draco and Boötes, with the name preserved only in the Quadrantids meteor shower – weren’t widely recognized and fell out of use, while others were split into smaller areas of the sky. Argo Navis constellation, Johannes Hevelius, Prodromus Astronomia, volume III: Firmamentum Sobiescianum, sive Uranographia, table EEE: Argo Navis, 1690. 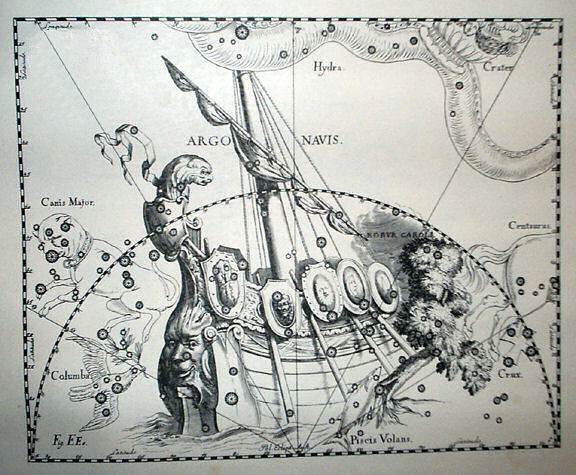 The Greek constellation Argo Navis, for instance, that represented the ship of Jason and the Argonauts, was divided by the French astronomer Nicolas Louis de Lacaille into Carina, Vela, and Puppis, three smaller constellations representing the ship’s keel, sails, and stern respectively. 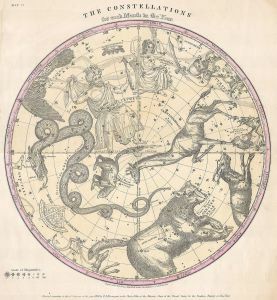 The new division was introduced in 1763, in the star catalogue Coelum Australe Stelliferum, published after de Lacaille’s death. Today, when talking about stars and deep sky objects being ‘in’ a given constellation, astronomers mean to say that they lie within the defined boundaries of the constellation. Constellations themselves are not real, as the stars and deep sky objects (nebulae, galaxies, clusters) belonging to them lie at very different distances from Earth and only appear close to one another because they lie in the same line of sight when seen from Earth. Since the stars and other visible objects are located at different distances, this also means that we are seeing them as they were at very different points in the past and not as they appear now. Antares in Scorpius, for instance, lies about 550 light years from Earth. We are therefore seeing it as it appeared some 550 years ago. The Trifid Nebula in Sagittarius is approximately 5,200 light years distant, so the image we are seeing is 5,200 years old. Galaxies lie at even greater distances. The famous Antennae Galaxies in Corvus are located some 45 million light years from Earth. This makes the images of the colliding pair 45 million years old. In ancient times, observers saw distinctive, identifiable patterns of stars in night sky, now called asterisms, and made up different kinds of stories that they associated with them. Orion, the Hunter and Taurus, the Bull, for instance, were known to many cultures since antiquity and associated with a number of different legends. Once the first astronomers started creating star maps, the most familiar asterisms were included in the maps to become the first constellations. The word constellation is derived from the Latin constellātiō, which can be translated as “set with stars.” The term comes from astrology, and was first used for asterisms that were believed to exert influence, as noted by Roman soldier and historian Ammianus Marcellinus in the 4th century. In the English language, the word was also initially used in astrology, from the 14th century onwards, and referred to conjunctions of planets. The term wasn’t used in the modern sense – to refer to an area of the celestial sphere – until the mid-16th century. 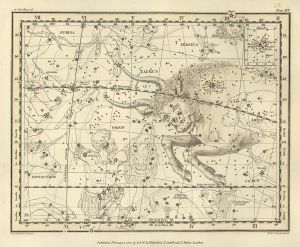 The 48 Greek constellations listed by Ptolemy in his Almagest in the 2nd century, which formed the basis for the modern division, were based on the work of the Greek astronomer Eudoxus of Cnidus, who is credited for introducing Babylonian astronomy to Greece in the 4th century BC. 30 of these constellations date back to ancient times and some of them, including the constellations of the zodiac, have a history going all the way back to the Late Bronze Age. Greek astronomers adopted Babylonian astronomy and, as a result, some of the Greek constellations contained the same stars as Babylonian ones, and were only listed under different names. The Almagest served as a basis for astronomy as taught from Late Antiquity to the Early Modern period in the west. Many of the southern stars could not be seen by Greeks, Babylonians, Arabs, Chinese, or any other culture north of the equator. The modern southern constellations were not defined until the age of exploration. They were charted by Dutch navigators Frederick de Houtman and Pieter Dirkszoon Keyser in the late 16th century and then included in Johann Bayer’s star atlas Uranometria (1603). A print of the copperplate engraving for Johann Bayer’s Uranometria (1661 edition) showing the new southern constellations. This image is courtesy of the History of Science Department at the University of Oklahoma. Bayer added a total of 11 new constellations, including Tucana, Musca, Dorado, Indus and Phoenix. He also assigned Greek letters to a total of 1,564 stars in different constellations, giving the stars designations in the order of brightness, starting from Alpha. These were mostly kept until present day, which is why out of some 10,000 naked eye stars, 1,564 have Bayer designations, consisting of a Greek letter and the name of the constellation in genitive form (Alpha Centauri, Beta Tauri, Gamma Aquilae, etc.) Some of these stars also have proper names as they were bright enough to be seen by ancient cultures, so we know Alpha Scorpii as Antares, Alpha Aquilae as Altair, Alpha Canis Majoris as Sirius, Alpha Orionis as Betelgeuse, and Alpha Tauri as Aldebaran, to only name a few. Several more constellations were added by the French astronomer Nicolas Louis de Lacaille in his catalogue published in 1756. Lacaille created 13 new constellations while mapping the southern skies from an observatory in South Africa. The Lacaille Family includes Octans, Fornax, Pictor, Antlia and Mensa, the last of which was named after Mons Mensa, or Table Mountain, which is where his observatory was located. The International Astronomical Union, formed in 1919, set out to define the official boundaries between the constellations in the 1920s. Eugène Delporte adjusted the modern boundaries along lines of right ascension and declination for the epoch B1875.0. As a result of the precession of the equinoxes, the boundaries will eventually have to be re-adjusted. Out of the official 88 constellations, 36 are found in the northern sky and the remaining 52 in the southern.